The cast and crew assemble to talk about this season, but avoid talking about the next. Marvel's Agents of S.H.I.E.L.D. is taking a week off, but don't worry, we'll have something up in place of our usual recap anyway! This is presumably to better align its events with the parallel S.H.I.E.L.D.-action occurring in Captain America: The Winter Soldier, which will bow in U.S. theaters just days after S.H.I.E.L.D. returns on April Fool's Day. But in advance of both events, the cast and crew of the series hit up Paleyfest yesterday to chat with fans (and moderator Felicia Day) and drop some hints. The big question on everyone's minds (at least, the biggest anyone could've presumably hoped to have answered at this juncture) was of course whether or not the series had been officially renewed for a second season, but with seven episodes yet to air the decision has apparently not yet been finalized. Though executive producer Jeph Loeb did confirm that the remaining episodes will air without further schedule interruptions, which came as a relief to the assembled crowd. Said crowd included a diverse range of attendees, from young children in Agent cosplay to adult fans angling for tidbits about the future of Marvel on television and potential crossovers with the Cinematic Universe. It's an open secret (particularly thanks to spoiler-dropping early reviews) that the events of Winter Soldier will feature major changes to S.H.I.E.L.D. 's standing. So much so that the series would likely have to address the events in the movie, but neither Loeb nor Melissa Tancharoen, Jed Whedon or Jeff Bell were willing to spoil anything further. The main cast was similarly resistant to making any big news: Clark Gregg (Coulson) joked about the likes of Scarlet Witch or Rocket Raccoon turning up, while Ming-Na Wen posited that her dream episode would be to reveal Skye (Chloe Bennett) as the secret lovechild of herself (as Agent May) and The Mighty Thor - mainly so that she could "flashback to those scenes" with Thor star Chris Hemsworth. Speaking of Agent May, it was also revealed - to somewhat awkward laughter - that the character was originally named "Agent Rice," but was changed for obvious reasons after Ming-Na was cast. Other highlights of the event included some inter-cast ribbing about shipping, with the biggest reaction (surprising absolutely nobody) coming when Bennett offered up support for "Skimmons," a fandom-posited pairing of Skye and Elizabeth Henstridge's Agent Simmons. Meanwhile, Clark Gregg - whose unexpected popularity as a supporting character in the films (he was cast as a "A Government Agent" so early in the production of Iron Man that it hadn't even been decided to involve S.H.I.E.L.D. in the plot yet) was the basis for starting the series in the first place - made at least two trips to the crowd to embrace excited fans. 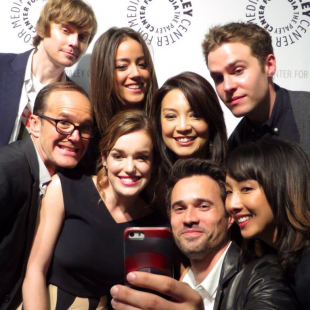 Finally, as has become the custom for such thing, a group selfie of the cast was taken for Twitter. "Marvel's Agents of S.H.I.E.L.D. is taking a week off"... again. How many weeks off has this show taken? I would like a second seson tho' but with everyone new (including new director, writers and production team ) except Agent Coulson. Ninja'd. I was just going to post virtually the same thing. It really feel that as soon as it gets up a bit of steam, it takes another fricking break. Then you are back to looking at the show wondering if it is worth your time or not. Personally, I think it's worth a second season, but only just. After all, most of Wheadon's shows (Firefly being the exception) took at least the first season to get into the swing of things. Who are the guy in the top left and the woman in the bottom right? Random interlopers or people I just don't remember from the show? They are the show runners Marissa Tancharoen and her husband Jed Whedon. I'm a proud Skimmons shipper. The writing is on the walls people! adding "Assemble" to every peace of news that has to do with avengers is getting kinda old.